Queers & Comics is BACK in Spring 2017! Queers & Comics Conference is coming to the West Coast! California College of the Arts is thrilled to host the 2nd biennial Queers & Comics conference in April 2017. 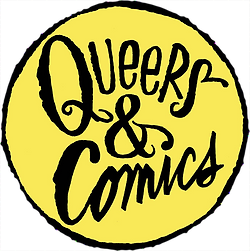 Queers & Comics features two days of discussion panels, workshops, readings, and comics galore, along with a multitude of off-site events. This year we will spotlight international and emerging LGBTQ cartoonists, the role of the San Francisco Bay Area, and the future of queer comics.